Welcome to my summer blog. I am taking a totally (un)deserved summer break by re-posting my Belizean Adventure 2013 edited with new pictures I was unable to post the first time. I’ve tried to improve and cut back on the text and I’m hoping the pictures make a re-visit worthwhile. So sit back and join me on Caye Caulker, an island off the coast of Belize where I arrived after visiting The Aguada Hotel in Santa Elena/San Ignacio, and Hopkins Inn in Hopkins Village on the Caribbean Coast. We’re well into March now, the weather is good, the swimming, food and drink good also. And so are our friends, as we re-acquaint ourselves with those we’ve met before and those we hope to meet again. .
We are looking forward now to our annual visit with our daughter, Rhiannon and her partner, Andrew, and our granddaughter, Clea. Clea is 8 years old and this will be her 4th visit. She has learned to swim in the Caribbean and this experience coupled with swimming lessons at home in Ontario have turned her into a good swimmer. She is confident in the water, even exhilarated by it. She started snorkeling at the split last year and was so proficient that Luciana, our host, has a special surprise for her. Rhiannon and family visit the ‘duty free’ and clear customs. Jason, our favourite taxi driver in Belize City, helps handle their luggage and the 12 bottles of red wine they have purchased on sale at $6 US. Don’t you just love visitors like that? And there they are. We are standing under some palm trees near the terminal when we spot the water-taxi swing round the tip of the island leaving a wake of white froth behind it as it lunges through the waves towards us. 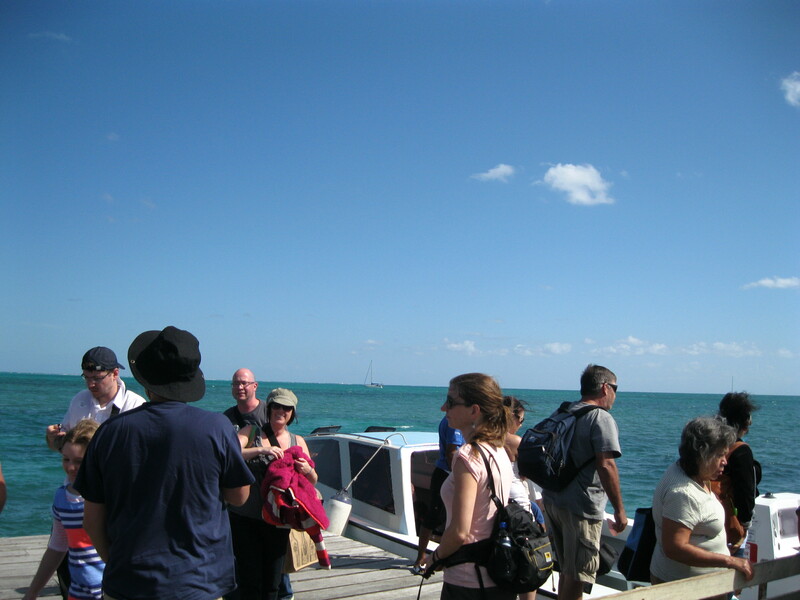 As the boat docks, we make our way out to greet them, then it is hugs and kisses and hand-shakes all around. Clea is as excited as only an 8 year old can get, but grandma and grumpa are pretty excited too. Back at the Oasis, we pick up on a routine we have established over the years. Our cabana or apartment is over Rhiannon’s cabana. I’m usually up making coffee by 7, sitting out on the verandah dunking a ‘hard times’ cookie when Evelyn joins me. We chat and watch life on the road in front of us, the first trickle of school kids and hard-working Belizeans on on the way to work, on foot, alone, in pairs or in small groups, bicyclists ghosting in and around them, the occasional golf-cart taxi humming slowly by, headed south to the little Tropic Air airport or north to the center of the caye. Usually the sun is up and shining through the littoral forest across from us. That’s where I take my ASUS tablet to check up on current affairs as presented by the Toronto Star. We see guests bird-watching in the oasis beneath us; we listen to the grackles grackling and song birds singing, but mainly we are waiting for our 8 yr. old bird in the nest beneath ours to wake up, spread her wings and fly into the arms of her grandma and grumpa. The general plan is to be ready to head for the split by 10. We are not regimental but we are usually ready to go by then. We all have our bicycles and pedal at a leisurely speed to get to the split, about 10-15 minutes away. By the time the rest of us have unpacked our snorkels and masks and spread out our beach blankets, Clea, in full gear for snorkeling , is in the water. It is a great place for us to swim because the water is often glass-clear, clean, with a firm sandy bottom and its boundaries are circumscribed by patches of sea weed. I’m usually in next, following Clea who is snorkeling ahead of me, diving for shells and occasionally emerging above the waves with a sea-star clutched in one hand. We snorkel together for a while, then we are joined by Evelyn and we track red snappers and 2′ baby barracudas through the water. Then Rhiannon and Andrew tag-team us and take over in the open sea-ring. When the four of us are ashore, Clea is lured out of the water with promises of sea-snacks like sun-chips and popcorn. Then she negotiates more time in the water. (Special Note. We’ve been in the sun for a couple of hours. We all applied sun screen lotion before leaving. It’s supposed to be water-proof but you can’t be too sure about that. We all wore hats while out of the water and draped towels over our shoulders or put on shirts if we thought we had had enough sun. We might have been over-protective with Clea who is fair-skinned but our efforts paid off with a golden tan after 6 days. After lunch it’s a nap for Clea, and maybe an afternoon swim in one of the swimming pools at the houses managed by Michael. When the owners are absent and the property has not been rented, Michael opens the gate and lets us in. Then it is time for a sun-downer and supper preparations. 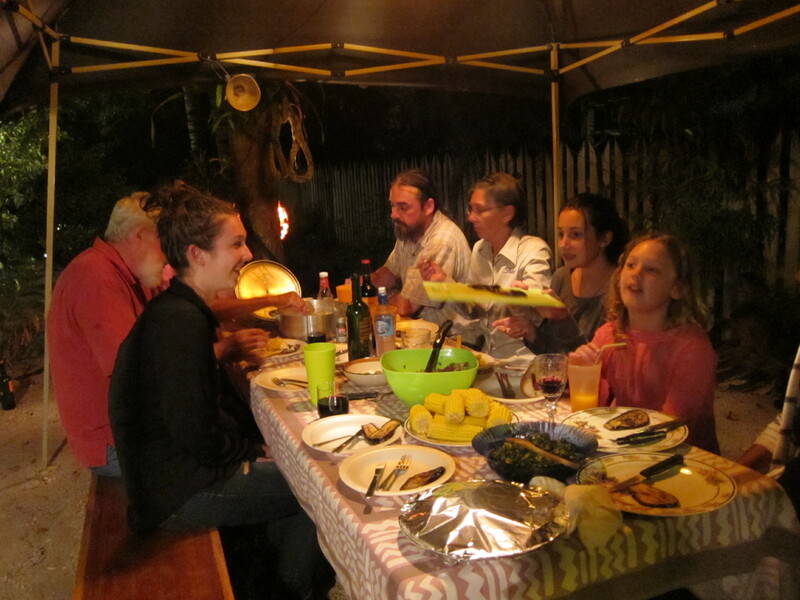 Many nights we barbecue outside under an almond tree and eat our meal under the near-by festivally-lit palapa. 1. Michael takes us out to the Barrier Reef on a snorkeling expedition. I watch from the boat as the serious snorkeling begins. 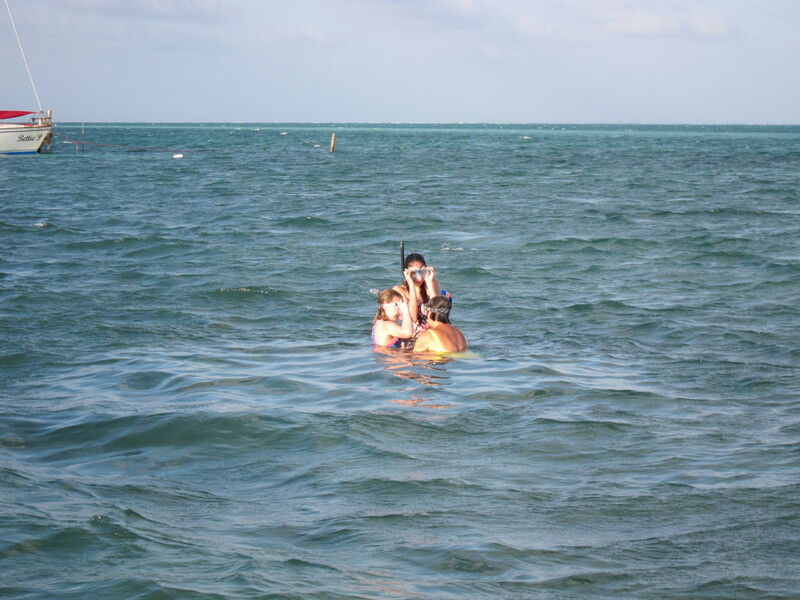 Luciana, Evelyn and Clea head for the reef. This is Clea’s first real snorkeling adventure outside of the split and it is on the second longest barrier reef in the world. I watch their fins stir up the water as they leave the boat far behind, headed for the reef. Then they disappear, all three of them, then after minutes of anxiety on my part, they reappear, one, two, three heads bobbing in the water. 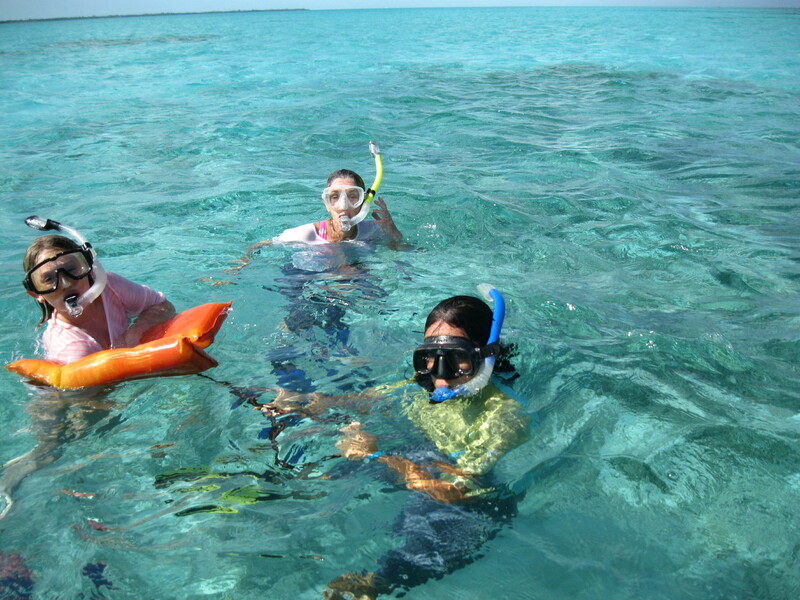 Afterwards, by all accounts, it was a fantastic snorkeling experience. Evelyn said they snorkeled in water as deep as 20′ and Clea dove as deep as 8′ or more to retrieve a sea urchin for examination. Back on shore, in the comfort of our cabana, with a double rum and water in my hand, Clea describes in detail what she witnessed, pointing out the fish on plastic identification cards. Next Post #6 Belize Adventure 2013 edited with New Pictures. 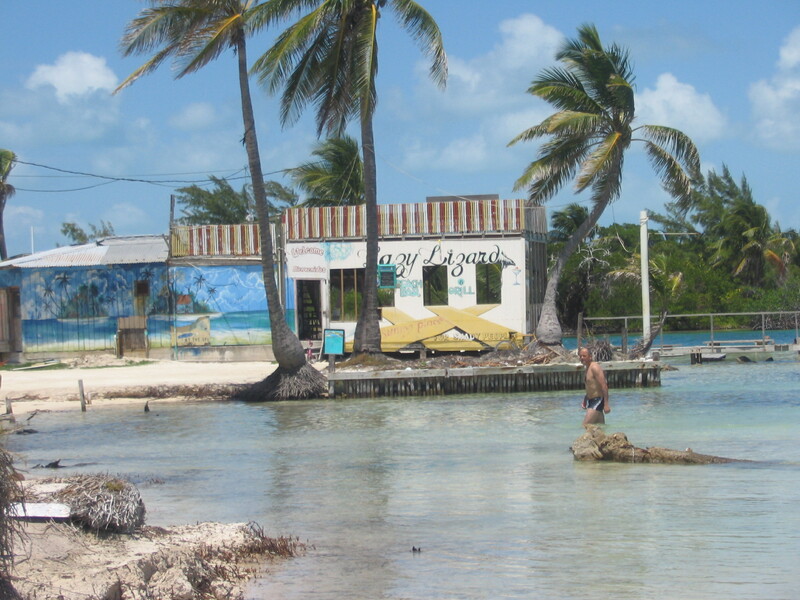 Life on the island of Caye Caulker continues…and the beat goes on. Or deal directly with me at http://www.babineb@silomail.com. $20 Cdn or US plus shipping and handling. Signed by the author. This entry was posted on Saturday, September 14th, 2013 at 1:29 pm	and posted in adventure, Travel. You can follow any responses to this entry through the RSS 2.0 feed.